Kumar, RNS, Kameswaran, M. Practical and ethical issues for delivery of advanced ENT services in the Indian subcontinent: efforts to 'Bridge the Gap'. Curr Opin Otolaryngol Head Neck Surg. 2019; :. doi: 10.1097/MOO.0000000000000542. PubMed PMID:30950835 . Goldsworthy, RL, Markle, KL. Pediatric Hearing Loss and Speech Recognition in Quiet and in Different Types of Background Noise. J. Speech Lang. Hear. Res. 2019;62 (3):758-767. doi: 10.1044/2018_JSLHR-H-17-0389. PubMed PMID:30950727 . Chaudhary, AK, Singh, V, Kumar, R, Avinashi, AA, Kumar, S. Mapping of Paediatric Cochlear Implant Using Neural Response Threshold (NRT) and Behavioural Observation Audiometry (BOA). Indian J Otolaryngol Head Neck Surg. 2019;71 (1):42-47. doi: 10.1007/s12070-018-1524-z. PubMed PMID:30906712 PubMed Central PMC6401049. Guex, AA, Hight, AE, Narasimhan, S, Vachicouras, N, Lee, DJ, Lacour, SP et al.. Auditory brainstem stimulation with a conformable microfabricated array elicits responses with tonotopically organized components. Hear. Res. 2019; :. doi: 10.1016/j.heares.2019.02.010. PubMed PMID:30867111 . Stahn, P, Lim, HH, Hinsberger, MP, Sorg, K, Pillong, L, Kannengießer, M et al.. Frequency-specific activation of the peripheral auditory system using optoacoustic laser stimulation. Sci Rep. 2019;9 (1):4171. doi: 10.1038/s41598-019-40860-8. PubMed PMID:30862850 PubMed Central PMC6414650. Nyberg, S, Abbott, NJ, Shi, X, Steyger, PS, Dabdoub, A. Delivery of therapeutics to the inner ear: The challenge of the blood-labyrinth barrier. Sci Transl Med. 2019;11 (482):. doi: 10.1126/scitranslmed.aao0935. PubMed PMID:30842313 . Wang, LL, Song, YT, Geng, MY, Mi, YF, Guo, XY, Wang, L et al.. [Clinical analysis of 54 patients with non-syndromic enlarged vestibular aqueduct]. Lin Chung Er Bi Yan Hou Tou Jing Wai Ke Za Zhi. 2019;33 (3):255-258. doi: 10.13201/j.issn.1001-1781.2019.03.017. PubMed PMID:30813697 . Hillyer, J, Elkins, E, Hazlewood, C, Watson, SD, Arenberg, JG, Parbery-Clark, A et al.. Assessing Cognitive Abilities in High-Performing Cochlear Implant Users. Front Neurosci. 2018;12 :1056. doi: 10.3389/fnins.2018.01056. PubMed PMID:30713488 PubMed Central PMC6346679. Wong, VSC, Meadows, M, Goldberg, D, Willis, DE. Semaphorin 3A induces acute changes in membrane excitability in spiral ganglion neurons in vitro. Eur. J. Neurosci. 2019; :. doi: 10.1111/ejn.14360. PubMed PMID:30706560 . Tejani, VD, Abbas, PJ, Brown, CJ, Woo, J. An improved method of obtaining electrocochleography recordings from Nucleus Hybrid cochlear implant users. Hear. Res. 2019;373 :113-120. doi: 10.1016/j.heares.2019.01.002. PubMed PMID:30665078 PubMed Central PMC6421572. Gallun, FJ, Seitz, A, Eddins, DA, Molis, MR, Stavropoulos, T, Jakien, KM et al.. Development and validation of Portable Automated Rapid Testing (PART) measures for auditory research. Proc Meet Acoust. 2018;33 (1):. doi: 10.1121/2.0000878. PubMed PMID:30627315 PubMed Central PMC6322842. Mulvihill, D, Kumar, R, Muzaffar, J, Currier, G, Atkin, M, Esson, R et al.. Inter-rater Reliability and Validity of Holgers Scores for the Assessment of Bone-anchored Hearing Implant Images. Otol. Neurotol. 2019;40 (2):200-203. doi: 10.1097/MAO.0000000000002100. PubMed PMID:30624403 . Lukasz, D, Kindt, KS. 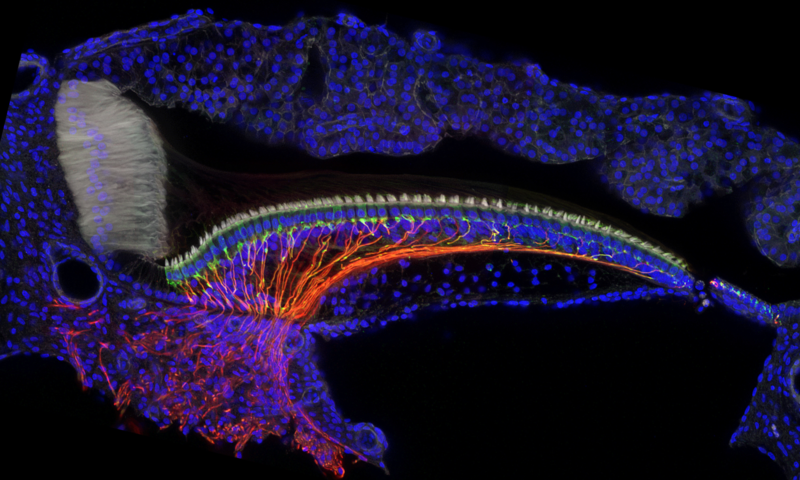 In Vivo Calcium Imaging of Lateral-line Hair Cells in Larval Zebrafish. J Vis Exp. 2018; (141):. doi: 10.3791/58794. PubMed PMID:30582593 . Kros, CJ, Steyger, PS. Aminoglycoside- and Cisplatin-Induced Ototoxicity: Mechanisms and Otoprotective Strategies. Cold Spring Harb Perspect Med. 2018; :. doi: 10.1101/cshperspect.a033548. PubMed PMID:30559254 . Page, JC, Cox, MD, King, D, Allsopp, T, Dornhoffer, JL. Long-term Outcomes of Ossiculoplasty With and Without an Intact Malleus. Otol. Neurotol. 2019;40 (1):73-78. doi: 10.1097/MAO.0000000000002050. PubMed PMID:30540697 . Schacht, SAL, Stahn, P, Hinsberger, M, Schick, B, Wenzel, GI. Laser-induced tissue remodeling within the tympanic membrane. J Biomed Opt. 2018;23 (12):1-8. doi: 10.1117/1.JBO.23.12.121614. PubMed PMID:30499262 . Dumas, AR, Schwalje, AT, Franco-Vidal, V, Bébéar, JP, Darrouzet, V, Bonnard, D et al.. Cochlear implantation in far-advanced otosclerosis: hearing results and complications. Acta Otorhinolaryngol Ital. 2018;38 (5):445-452. doi: 10.14639/0392-100X-1442. PubMed PMID:30498273 PubMed Central PMC6265674. Kumar, R, Singh, A, Sagar, P, Behera, C, Kumar, R. Access to Round Window Niche via Posterior Tympanotomy and Impact of Drilling Its Overhangs: A Cadaveric Descriptive Study. Indian J Otolaryngol Head Neck Surg. 2018;70 (4):510-514. doi: 10.1007/s12070-018-1469-2. PubMed PMID:30464907 PubMed Central PMC6224826. Jakien, KM, Gallun, FJ. Normative Data for a Rapid, Automated Test of Spatial Release From Masking. Am J Audiol. 2018;27 (4):529-538. doi: 10.1044/2018_AJA-17-0069. PubMed PMID:30458523 PubMed Central PMC6436452. Watkins, GD, Swanson, BA, Suaning, GJ. An Investigation of the Effect of AGC Gain on the Output Signal to Noise Ratio in Cochlear Implant Sound Processing. Conf Proc IEEE Eng Med Biol Soc. 2018;2018 :1206-1209. doi: 10.1109/EMBC.2018.8512471. PubMed PMID:30440606 .